South Africa is ready to host the African Development Bank's Africa Investment Forum (AIF) which is a world-class initiative that is positioned to transform the continent's infrastructure development landscape. 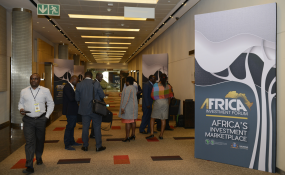 The summit is scheduled to take place at the Sandton Convention Centre, Johannesburg, from November 7-9 under the theme: All set for Africa's first investment marketplace. The AIF, which is an innovative investment marketplace, will bring together project sponsors, pension funds, sovereign wealth funds, private investors, policymakers, private equity firms, and Heads of Government to raise capital to advance Africa's economic transformation agenda. "The focus is on structuring deals, screening and enhancing projects, attracting co-investors, and facilitating transactions to unlock Africa's multi-billion dollar investment opportunities." The bank said it is working with other multilateral development partners and stakeholders to ensure that the Africa Investment Forum becomes Africa's key springboard for investment and for meeting the continent's massive infrastructure and development needs.